The shortest month of the year is not short on events and news items. February 2019 is filled with major national events and global observances to celebrate and commemorate. Download our events calendar February 2019 below. Throughout the month of February, we look to bringing awareness for ovarian cancer, heart research, bowel cancer and more. This support extends to significant international observances like World Cancer Day and International Asperger’s Day. More global events include Lunar New Years, Valentine’s Day, and major US events like the Super Bowl and the 91st Academy Awards. On the national front, we honour and commemorate significant dates in Australia’s history with the 10th Anniversary of the Black Saturday Bushfires and the Anniversary of the National Apology to Australia’s Indigenous Peoples. 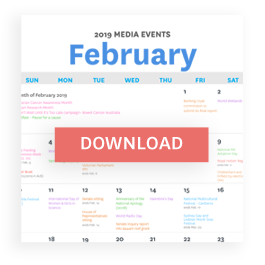 Download our February media events calendar to never miss out on future opportunities and to help plan your upcoming campaigns around key dates, and what journalists have on their coverage agenda. Interested in expanding your Media Coverage? Sign up free and have your event sent to over 12,000 journalists and editorial inboxes across Australia with AAP’s Editorial Diary.